Buy live Auratus Cichlids from a trusted breeder. All orders shipped to your door with a live arrival guarantee. Any fish that are DOA can be replaced or refunded. The Melanochomis Auratus cichlid is a highly aggressive cichlid that is native to the water of Lake Malawi in Africa. It is mostly found in the Jalo Reef region and southward along the west cost of the lake. Also known as the golden mbuna or Malawi Golden cichlid, this fish is very popular with aquarium owners because of it's striking color pattern. Juveniles and females feature a bright yellow body with black and white stripes on the upper half. Dominant males change color to feature a dark brown or almost black body with light blue and yellow stripes on the upper half. Melanochromis Auratus and highly aggressive and dominant males are probably one of the most aggressive mbuna. Because of the high aggression, these fish need plenty of space in an aquarium and should only be kept with other aggressive mbuna. 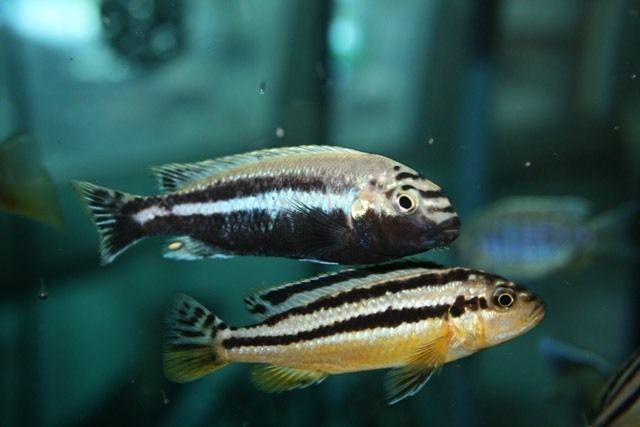 A species tank should have only one male Auratus cichlid with several females, and should be at least 50 gal. in size. If mixed with other mbuna, the tank should be 90 gal. or larger to give the fish territories to claim. Some other compatible mbuna include; the Kenyi cichlid, the Bumblebee cichlid, and the Polit cichlid. The aquarium for Melanochromis Auratus cichlids should have hard water that is between 76-82°F and a pH of 7.8-8.6. Additives like Cichlid Lake Salt and Malawi/Victoria Buffer will condition the aquarium water for African cichlids. It is best to use plenty of rocks to provide caves and passageways for these fish to explore, claim territories and seek protection. Auratus cichlids should be fed a variety of protein and vegetable based foods. Commercial flakes and pellets with that are plankton or spirulina based are good choices. Mix in frozen or freeze dried foods like bloodworms or brine shrimp, to give them good variety in their diet and promote good health. Here is a video of Auratus cichlids (some juveniles) in an aquarium decorated with rocks and cichlid stones to create hiding places. The Auratus cichlid is a sexually dimorphic fish where dominant males change colors from the yellow with black and white striping pattern to a dark brown color with light blue and yellow stripes. Both juveniles and females have the same color and less aggressive males may maintain the yellow color pattern much longer than a dominant male. When breeding these fish in a home aquarium, there should be only one male and several females in the breeding tank. This will help to divide the attention of the male between all the females. Auratus cichlids are mouthbrooders which means that the female will carry her eggs and fry in her mouth to protect them. After spawning, the female takes the eggs in her mouth till the eggs are ready to hatch. She will also carry the fry in her mouth for up to a month after they hatch.